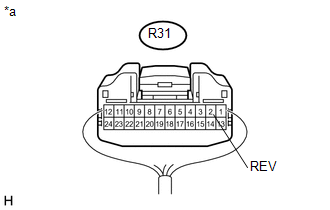 The radio and display receiver assembly*1 or navigation receiver assembly*2 receives a reverse signal from the park/neutral position switch*3 or the back-up light switch assembly*4. (c) Reconnect the radio and display receiver assembly connector. 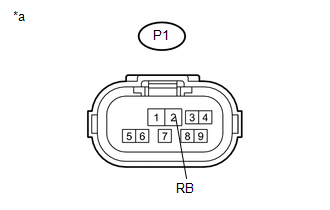 (c) Reconnect the park/neutral position switch connector. (b) Disconnect the P1 park/neutral position switch connector. 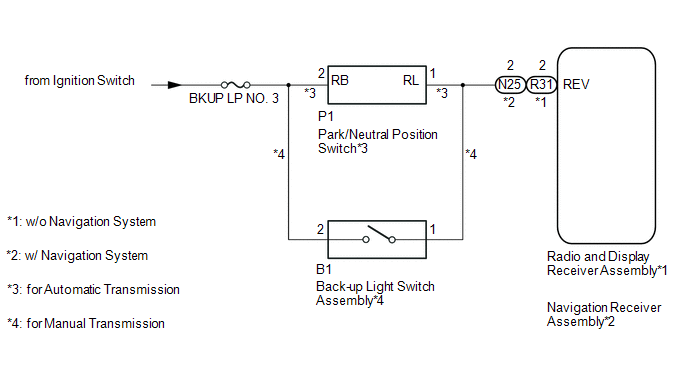 (e) Reconnect the park/neutral position switch connector. (a) Disconnect the back-up light switch assembly connector. (c) Reconnect the back-up light switch assembly connector. 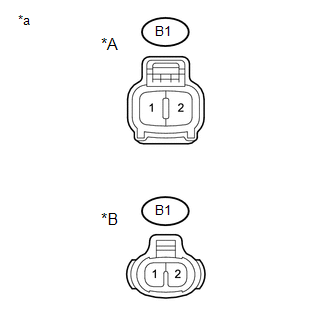 (b) Disconnect the B1 back-up light switch assembly connector. (e) Reconnect the back-up light switch assembly connector. (c) Reconnect the navigation receiver assembly connector.